Our Sandy’s™ organic cloth diapers come in two main sizes: Small (8-20 lbs.) and Large (20-35 lbs.) 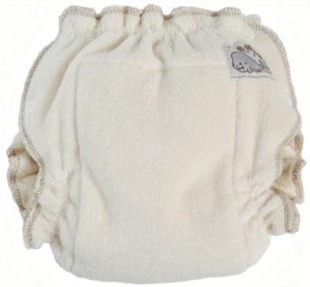 We also offer this organic diaper in Newborn size which offers a custom fit for newborns. 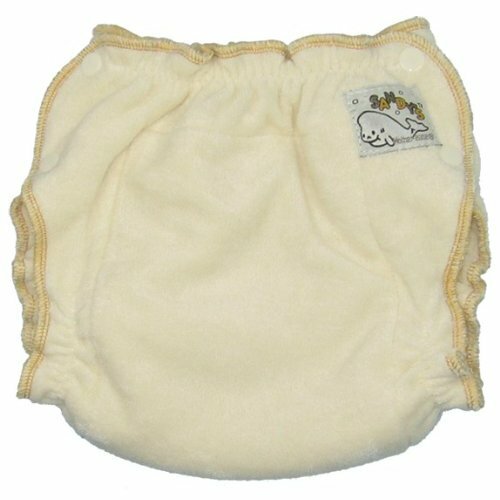 These organic cotton cloth diapers are made from our same soft stretchy organic terry cloth using the same quality of workmanship, but they have an extra layer of absorbent organic terry sewn to the inside of the diaper. The fit of the cloth diaper is slightly roomier. Elastic at the waist front and back as well as the leg openings, together with the snap closures at the sides create a clean pant-like look. A serged edge finishes the diaper. Our large Sandy’s™ cloth diaper is one of the most absorbent cloth diapers ever, and holds 15 oz. When used together with our Sandy’s™ Cloth Diaper Liners it makes an extravagant nighttime cloth diaper.